“I resolved, therefore, to direct my mind to the Holy Scriptures, that I might see what they were. And behold, I saw something not comprehended by the proud, not disclosed to children, something lowly in the hearing, but sublime in the doing, and veiled in mysteries. Yet I was not of the number of those who could enter into it or bend my neck to follow its steps. For then it was quite different from what I now feel. When I then turned toward the Scriptures, they appeared to me to be quite unworthy to be compared with the dignity of Tully. For my inflated pride was repelled by their style, nor could the sharpness of my wit penetrate their inner meaning. Truly they were of a sort to aid the growth of little ones, but I scorned to be a little one and, swollen with pride, I looked upon myself as fully grown” (Confessions, 3.5). Over the course of his career, however, Augustine becomes more and more captivated by the simple profundity of Scripture, and more and more closely tied to Scripture in his theological argumentation. One thinks of the way Scriptural quotations are seemingly effortlessly interwoven into his prayer language in Confessions, or statements like this in De Trinitate: “in this matter we have the authority of God’s Scriptures, which our minds should not stray from, the solid foundation of divine utterances which we must not leave, to plunge down the steep slopes of our own guesswork into places where neither our senses can guide us nor the clear reason of truth can enlighten us” (III.22). Throughout the course of his life this movement away from speculation and towards Scripture in Augustine’s methodology becomes more and more apparent. Late in life he would write: “such is the depth of the Christian Scriptures that, even if I were attempting to study them and nothing else, from boyhood to decrepit old age, with the utmost leisure, the most unwearied zeal, and with talents greater than I possess, I would still be making progress in discovering their treasures” (260). Augustine puts this view into practice: at age 72, near the end of his life, Augustine is conducting a study project on the history of the Kings of Israel, making new discoveries as he goes (427, 431-2). Only a new waves of Pelagian pamphlets and books by Julian of Eclanum will distract Augustine from this project. The Bible also comes to have a central role in Augustine’s understanding of spiritual experience. Augustine does not, as many contemporaries do, seek the beatific vision through mystical contemplation, but approaches Scripture as the primary arena in which we can see God. He refers to it as a bridge crossing over the gulf which stands between the beatific vision and fallen human conscious of God: “a mind that had one hoped to train itself for the vision of God by means of the Liberal Arts, would now come to rest on the solid, intractable mass of the Christian Bible” (259). One can see this play out in Augustine’s own spiritual autobiography. Its interesting that The Confessions, having recounted Augustine’s spiritual journey in 9 chapters, does not conclude but continues on with several more chapters on the creation account of Genesis. Why this discussion, and why here at the end of Confessions? Does it mark a deviation from earlier sections of the book? Brown suggests that Scripture has become so embedded as part of the fabric of Augustine’s spiritual consciousness and outlook that this last section is not a deviation from his story but a natural extension of it: “the last three books of his Confessions are in many ways the most strictly autobiographical part of the whole book” (259). One can also see the seriousness with which Augustine comes to take Scripture in his letters with Jerome. When Jerome is seeking to move away from an argument and suggests that they “play together harmlessly in the fields of the Scriptures,” Augustine replies: “as for me, I prefer to do things in earnest and not to ‘play’ … as if studying the Scriptures were a matter of romping around on level ground, not puffing and panting up a steep mountain-face” (272). This image of running up a mountain may communicate something of Augustine’s hermeneutical approach, for he did rely upon an allegorical interpretation which sought to discover hidden meanings and connections within the biblical text. But for him this approach was connected to his entire way of seeing truth. Brown writes: “in interpreting so much of [the Bible] as an allegory, Augustine was finding in it all that he had always valued in his intellectual activity – hard labor, the excitement of discovery, and the prospect of endless movement in a philosopher’s quest for Wisdom” (260). 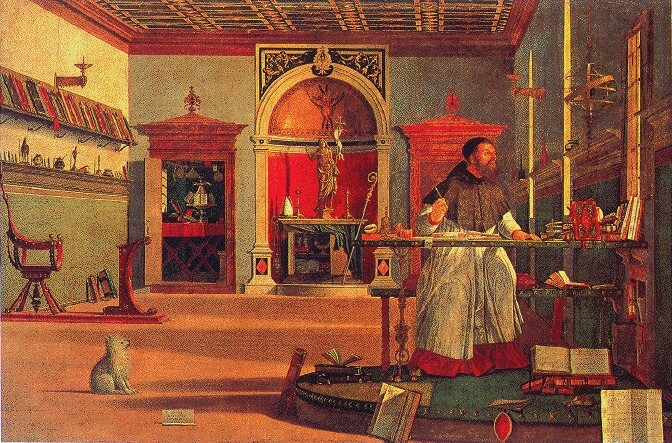 Augustine tied his allegorical approach to Scripture toward the role of images and signs in kindling affection for divine things: “the presentation of truth through signs has great to feed and fan that ardent love, by which, as under some law of gravitation, we flicker upwards, or inwards, to our place of rest. Things presented in this way move and kindle our affection far more than if they were set forth in bald statements” (260). While I do not agree with Augustine’s allegorical approach to Scripture, I think we should be cautious of being dismissive of his use of Scripture for this reason. First of all, almost all of the church fathers approached Scripture in this way. Second, allegory is not always or intrinsically unhelpful. It is its misuse and overuse that causes the problem. And third, one can have a faulty hermeneutical grid and still a commendable approach to Scripture in other respects. One can see this in Augustine’s preaching: even sermons governed by an allegorical interpretation have great spiritual value in their application. As regards our writings, which are not a rule of faith or practice, but only a help to edification, we may suppose that they contain some things falling short of the truth in obscure and recondite matters, and that these mistakes may or may not be corrected in subsequent treatises. For we are of those of whom the apostle says: “And if you be otherwise minded, God shall reveal even this unto you.” Such writings are read with the right of judgment, and without any obligation to believe. In order to leave room for such profitable discussions of difficult questions, there is a distinct boundary line separating all productions subsequent to apostolic times from the authoritative canonical books of the Old and New Testaments. The authority of these books has come down to us from the apostles through the successions of bishops and the extension of the Church, and, from a position of lofty supremacy, claims the submission of every faithful and pious mind. If we are perplexed by an apparent contradiction in Scripture, it is not allowable to say, The author of this book is mistaken; but either the manuscript is faulty, or the translation is wrong, or you have not understood. In the innumerable books that have been written latterly we may sometimes find the same truth as in Scripture, but there is not the same authority. Scripture has a sacredness peculiar to itself. In other books the reader may form his own opinion, and perhaps, from not understanding the writer, may differ from him, and may pronounce in favor of what pleases him, or against what he dislikes. In such cases, a man is at liberty to withhold his belief, unless there is some clear demonstration or some canonical authority to show that the doctrine or statement either must or may be true. But in consequence of the distinctive peculiarity of the sacred writings, we are bound to receive as true whatever the canon shows to have been said by even one prophet, or apostle, or evangelist. Otherwise, not a single page will be left for the guidance of human fallibility, if contempt for the wholesome authority of the canonical books either puts an end to that authority altogether, or involves it in hopeless confusion. Thus it is clear that alongside Augustine’s belief in the authority of church and tradition, he assigns a special authority to Scripture (“sacredness peculiar to itself”), which is distinct from all subsequent writings in the church by being, unlike them, absolutely binding (note his phrase “distinct boundary line”). Thus, as one of the comments in the blog post linked above suggests, Augustine may not have been a proto-reformer, but he certainly wasn’t a Tridentine Catholic either.